Tacitus wakes up at 8am and goes straight to the smithy with Ghorza. At 8pm they stop working and return to Understone Keep for a four-hour dinner until 12am, when they sleep there. 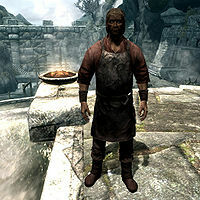 He wears a blacksmith's apron and a pair of boots. He carries an iron dagger along with a selection of common items and gold. He will introduce himself by saying, "I'm Ghorza's assistant. I help her with the forge." He is admittedly not very confident in his ability and he can often be heard saying things like "Ghorza is the one you should ask if you need anything. ", "I'm not very good for anything more than smithing nails right now." and "One time, I almost cut a finger off sharpening a blade. I hate blood." His lack of confidence will be shown further if Ghorza dies and he becomes the owner of the smithy as he will tell you, "I run the forge now. Kind of... scary. ", "Making weapons and armor isn't like making nails at all. ", and "You need a sword? Uh, how about a small sword? Nail-sized?" Upon ending conversation and he is near the smithy, Tacitus will say either "I should heat up the forge. Why does it have to be so hot?" or "Oh, goodbye then." His master, Ghorza, does not think highly of him either, as she can be found saying, "Don't bother with Tacitus. Useless." and "You'd think an apprentice could forge a few hinges. Not Tacitus." However, she will still try to help him by asking you to find a book for him to read, as he "sure isn't learning by example." Investing with Tacitus also grants you an extra 500 septims with Moth gro-Bagol, who cannot be invested in the normal way.